In what sense can something be, at one and the same time, both a discrete particle (Werner Heisenberg) and a continuous wave (Erwin Schrödinger)? The information interpretation of quantum mechanics explains that the wave function is purely abstract immaterial information about where concrete material particles will be found statistically when a large number of particles are measured. Quantum waves are never seen. They are not "observables," which Heisenberg made his chief criterion for the new quantum mechanics. He declared that the electron orbits of the "old" quantum theory of the Bohr atom simply do not exist because they are not observable. Only the spectral lines of light given off by transitions between energy levels are observable, he said. Following the traditional Copenhagen Interpretation, many physicists today describe a quantum object as either a wave or a particle, depending on the free choice of the experimenter. Calculations by a physicist describing the evolution of a quantum system, an electron or a photon, for example, goes in two stages. Between measurements there is a wave stage in which the wave function explores all the possibilities available, given the configuration of surrounding particles, especially those nearby, which represent the boundary conditions for the Schrödinger equation of motion for the wave function. Because the space where the possibilities are non-zero is large, we say that the wave function (or "possibilities function") is nonlocal. Albert Einstein always hoped for a local "objective reality." An observer can not gain any empirical knowledge unless new information has first been irreversibly recorded, e.g., when a particle has been localized in the experimental apparatus. The other stage is measurement, when the photon or electron interacts with one or more of the surrounding particles, including the measurement apparatus. At this point, one of the nonlocal possibilities may be "actualized" or localized. The quantum process raises deep metaphysical questions about possibilities, with their calculable probabilities, and the actualities. Information about the new interaction may or may not be recorded. If the new information is irreversibly recorded, it may later be observed. It must be recorded before it can be observed. A "conscious observer" is not involved in the recording of the measurement. The recording of a measurement happens before the observer makes an observation. In modern physics, that can be days or weeks before the observation which requires lengthy calculations and "data reduction." When you hear or read that electrons are both waves and particles, you might think "either-or" - between measurements a wave of possibilities, then an actual particle. Or you might accept Einstein's deeply help belief that it is always a particle with a path, despite the practical impossibility of making measurements along the path. Also in 1909, Einstein’s imagined an experiment in which the energy of an electron (a cathode ray) is converted to a light quantum and back. As far as we know today, the speed of the secondary cathode rays depends neither on the distance between P1 and P2, nor on the intensity of the primary cathode rays, but rather entirely on the speed of the primary cathode rays. Let’s assume that this is strictly true. What would happen if we reduced the intensity of the primary cathode rays or the size of P1 on which they fall, so that the impact of an electron of the primary cathode rays can be considered an isolated process? If the above is really true then, because of the independence of the secondary cathode rays’ speed on the primary cathode rays’ intensity, we must assume that an electron impinging on P1 will either cause no electrons to be produced at P2, or else a secondary emission of an electron whose speed is of the same order as that of the initial electron impinging on P1. In other words, the elementary process of radiation seems to occur in such a way that it does not scatter the energy of the primary electron in a spherical wave propagating in every direction, as the oscillation theory demands. 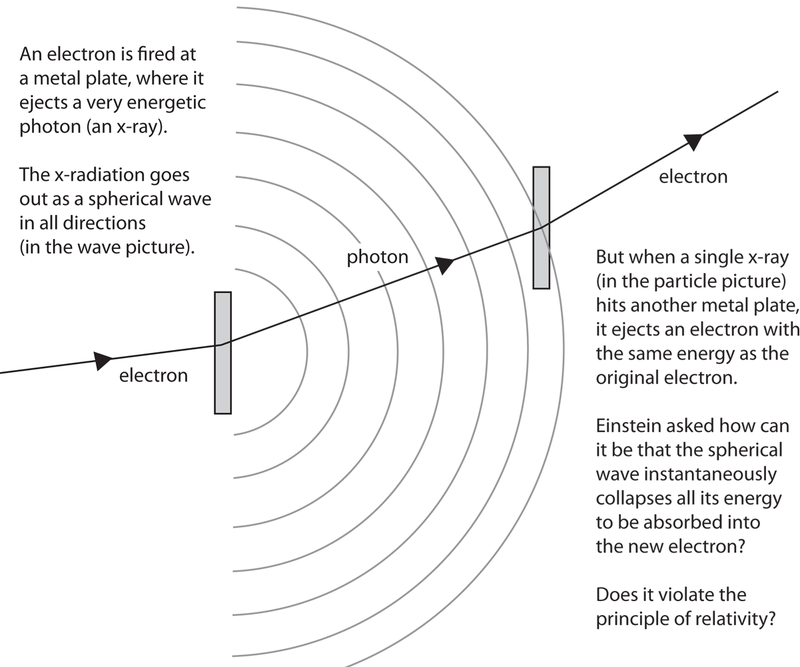 Extending his 1905 hypothesis, Einstein shows energy can not spread out like a wave continuously over a large volume, because it is absorbed in its entirety to produce an ejected electron at P2, with essentially the same energy as the original electron absorbed at P1. Rather, at least a large part of this energy seems to be available at some place on P2, or somewhere else. The elementary process of the emission of radiation appears to be directional. Moreover, one has the impression that the production of X-rays at P1 and the production of secondary cathode rays at P2 are essentially inverse processes...Therefore, the constitution of radiation seems to be different from what our oscillation theory predicts. The theory of thermal radiation has given important clues about this, mostly by the theory on which Planck based his radiation formula...Planck’s theory leads to the following conjecture. If it is really true that a radiative resonator can only assume energy values that are multiples of hν, the obvious assumption is that the emission and absorption of light occurs only in these energy quantities. On the basis of this hypothesis, the light-quanta hypothesis, the questions raised above about the emission and absorption of light can be answered. As far as we know, the quantitative consequences of this light-quanta hypothesis are confirmed. This provokes the following question. 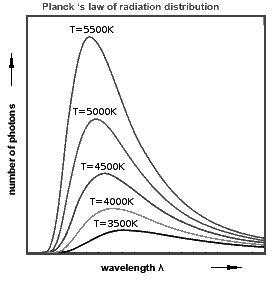 Is it not thinkable that Planck’s radiation formula is correct, but that another derivation could be found that does not rest on such a seemingly monstrous assumption as Planck’s theory? Is it not possible to replace the light-quanta hypothesis with another assumption, with which one could do justice to known phenomena? If it is necessary to modify the theory’s elements, couldn’t one keep the propagation laws intact, and only change the conceptions of the elementary processes of emission and absorption? This conception seems to me the most natural: that the manifestation of light’s electromagnetic waves is constrained at singularity points, like the manifestation of electrostatic fields in the theory of the electron. I imagine to myself, each such singular point surrounded by a field that has essentially the same character as a plane wave, and whose amplitude decreases with the distance between the singular points. If many such singularities are separated by a distance small with respect to the dimensions of the field of one singular point, their fields will be superimposed, and will form in their totality an oscillating field that is only slightly different from the oscillating field in our present electromagnetic theory of light. Einstein thus imagines many singular points (his light quanta) whose average behavior has the shape of a light wave. Just as a large number of randomly distributed discrete points approaches the smooth continuous appearance of the normal distribution, Einstein imagines the “totality” of points would look like an oscillating light wave or field. Einstein never published the implicit idea that the light wave would be stronger where there are many particles, less where there are few. But he described to many friends, including Max Born, the idea of a “ghost field” (Gespensterfeld) or “guiding field” (Führungsfeld) that represents the probability of finding a particle at different positions. The “fusion of wave and emission theories of light” that Einstein expected is now seen to consist of a theoretical continuous field that provides abstract information (probabilities) about the outcomes of experiments on localized discrete particles. The "statistical interpretation" of Max Born, which was based on Einstein's ideas about a "ghost field" (Gespensterfeld) or "guiding field" (Führungsfeld), tells us the outgoing wave is the probability amplitude wave function Ψ, whose absolute square is the probability of finding a light particle in an arbitrary direction. Some time before the discovery of quantum mechanics people [viz., Einstein!] realized that the connexion between light waves and photons must be of a statistical character. What they did not clearly realize, however, was that the wave function gives information about the probability of one photon being in a particular place and not the probable number of photons in that place. But if we accept that Einstein always conceived the particle as indivisible and located at a given point in space and time (his local "objective reality"), we can agree with Dirac that the wave function gives us the probability of the individual particle "being in a particular place."